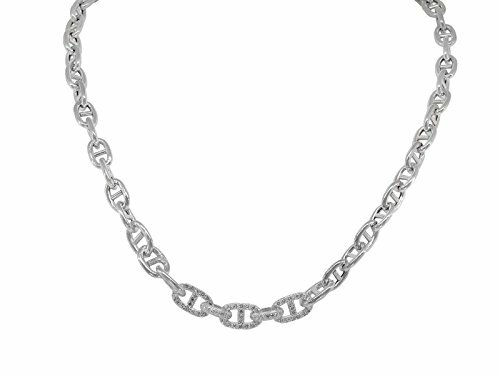 Elegant and thick marine links chain accentuated by cz infused links. Approximately 17 inches long. THE STORY: The Fronay Collection is a family run jewelry company with over 6 generations worth of experience in design and manufacture. THE MISSION: At the Fronay Collection, we pride ourselves on being the company that offers luxury quality jewelry at affordable prices. Each piece is made with top craftsmanship and only the best materials. THE METAL: Luminous 925 Sterling Silver . A luxurious sparkle, shine and polish. THE NECKLACE: Make a statement with an elegant marine double link chain accentuated with sparkling AAA rated cubic zirconia stones. If you have any questions about this product by Fronay Collection, contact us by completing and submitting the form below. If you are looking for a specif part number, please include it with your message.